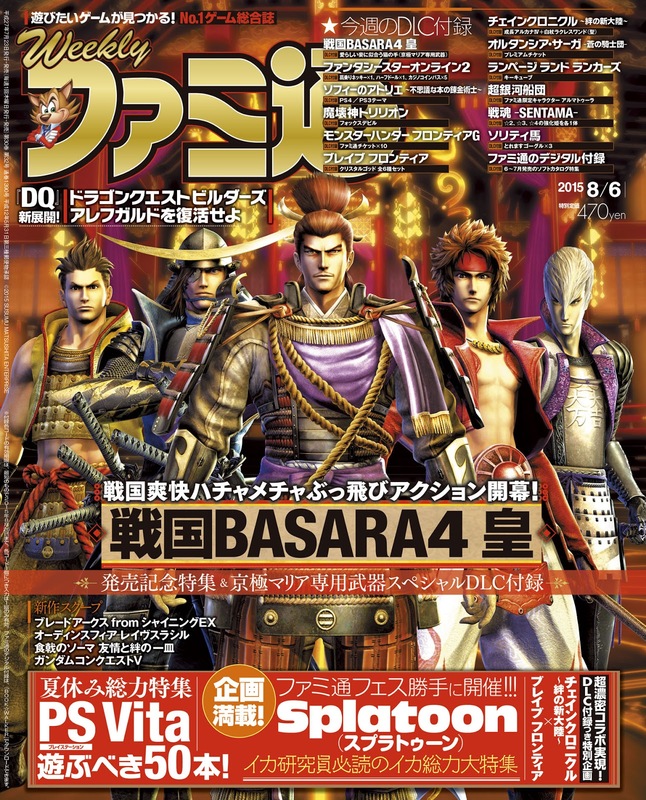 The biggest information today is the release of Weekly Famitsu and Dengeki PlayStation magazines, both of which have prominent articles about Sengoku Basara 4 Sumeragi to celebrate its release. I skimmed through the articles quickly and couldn't see anything new, but there's a truly massive amount of data to pick through so I'll post about it later in the week. There are also further details about many of the collaborations announced in yesterday's tenth anniversary live broadcast, so in spite of slacking off with the magazines this is a very long post once again. I want to add one more thing before I get started. Since he's been working so hard, I'm going to tweet evidence that I'm playing the game overseas to KobaP in the hope that it will make him happy and (gently) spread awareness that there are fans all over the world. I encourage all of the other importers out there to do the same! 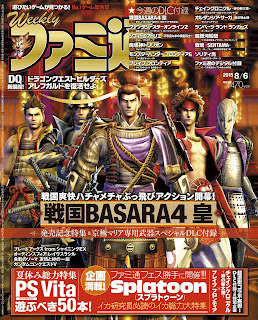 Both magazines came with a Sengoku Basara 4 Sumeragi DLC weapon this week. If you just want the DLC codes, you can buy them as e-books through BookWalker. First, purchase the 30th July 2015 edition of Weekly Famitsu magazine for ¥350 here (Maria's weapon) and Dengeki PlayStation for ¥526 here (Sakon's weapon). It's easy to identify the right issues as they both have really awesome covers. Proceed through checkout as normal. You can use Paypal if you're buying from overseas. Then, once checkout is complete go to your account page. 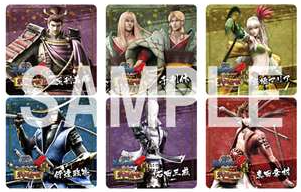 The account page can be switched to English so just go to the Campaign section, find the code(s) which mention 戦国BASARA. You can enter them into your Japanese PSN account to redeem your special weapons! 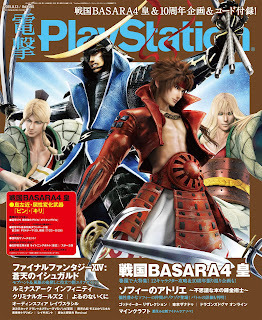 Weekly Famitsu and Dengeki PlayStation are also available through most import-friendly book stores such as Amazon Japan. The DLC codes will only work until 11th January 2016 so don't forget to activate them on PSN. The third magazine-exclusive weapon with V-Jump won't be available until next month, so that's all for now! Warning: Early reports from multiple users indicate that you can only use DLC from the same zone as your game save on PS4. It might be best to start over with a Japanese account if you want that DLC. 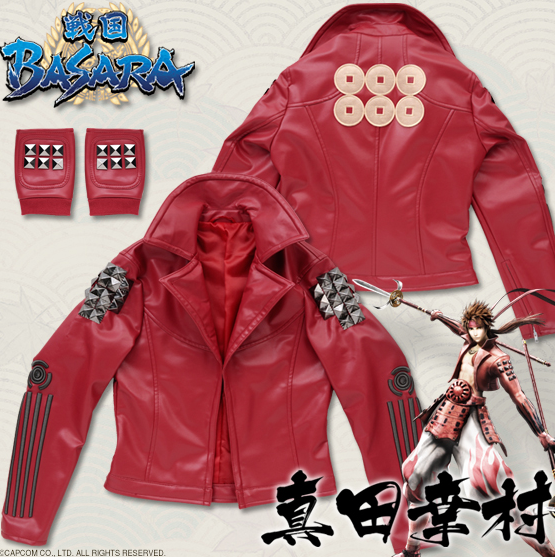 If you want that amazing jacket from yesterday's live stream (and have enough money), it can now be ordered from the Premium Bandai shop. Preorders close on 20th August 2015 and the jackets will ship in September. The price is ¥100,000 and I didn't realise before but it comes with a pair of matching gloves as well. There's a feature article on the store's blog as well to make it seem even more desirable. 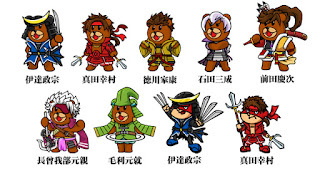 We saw glimpses of the Taka No Tsume (Eagle Talon) characters dressed up as Masamune and Yukimura, and now more Sengoku Basara characters are getting in on the fun. 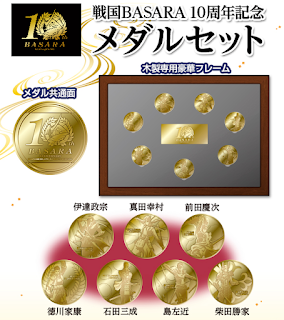 If you wanted a closer look at the 10th Anniversary Medal Set mentioned yesterday, the Entersis website has posted a listing with proper pictures. 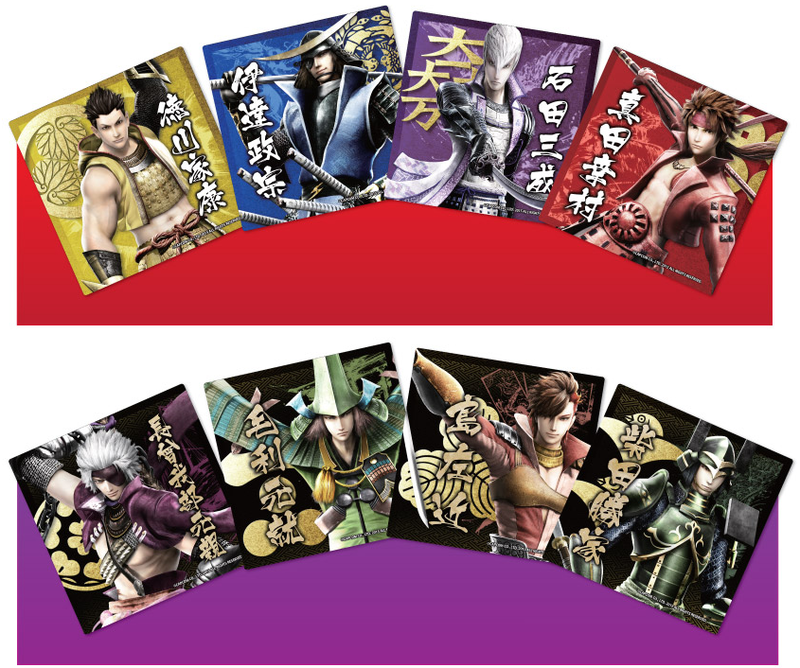 The characters featured are Masamune, Yukimura, Keiji, Ieyasu, Mitsunari, Sakon and Katsuie. The medals will be released in mid-October 2015 priced at ¥5,400. The official website for the cake range is now online and the pictures look delicious. They're five-layer sponge cakes with strawberry pieces and cream as filling, surrounded by biscotti and topped with orange, peach, kiwi, grapefruit and raspberry and a choice of fresh or chocolate cream. Sadly, they only deliver within Japan. A press release has teased the special menu items which visitors to one of the many Pasela-run entertainment cafes and karaoke joints can enjoy. 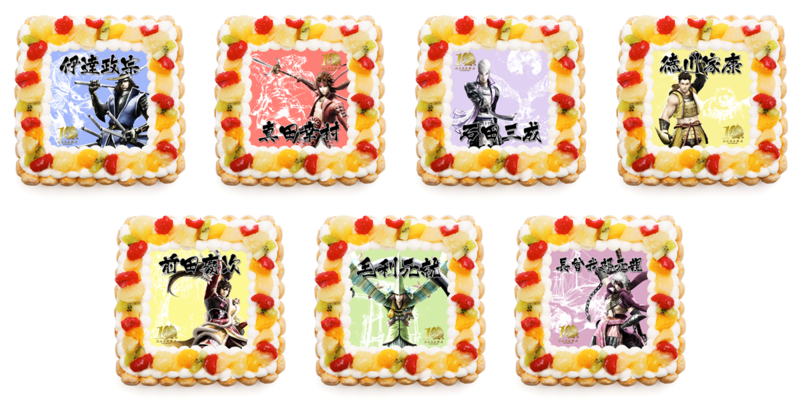 These are just some of the items themed on Rikyuu, Maria, Sakon, Yoshiteru and Matabee which will be on offer in the Ueno Three Monkeys Cafe and Osaka Three Monkeys Cafe venues. 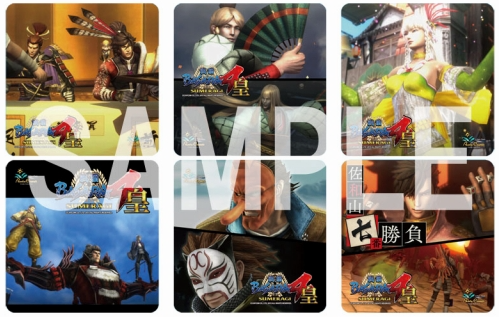 Ordering from the Sengoku Basara menu will reward you with one of forty randomly-picked Sengoku Basara 4 Sumeragi coasters. 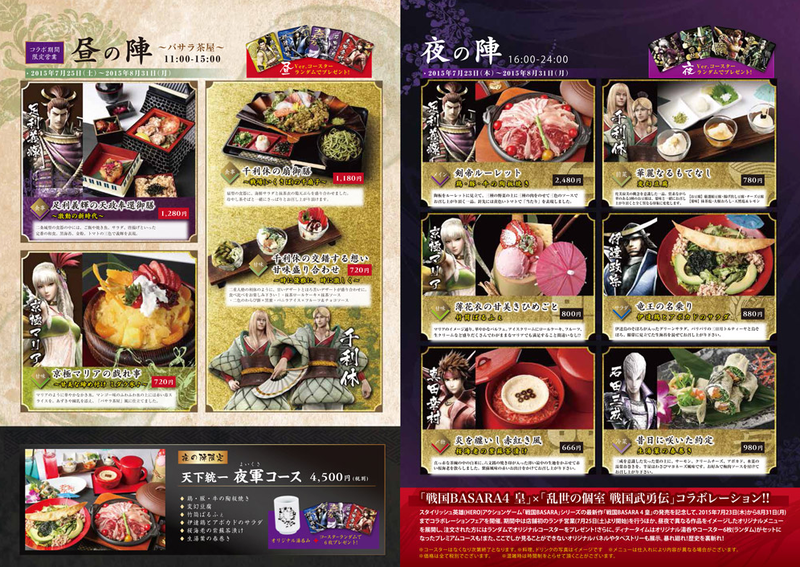 There will also be a Sengoku Basara 4 Sumeragi menu in selected Karaoke Pasela venues across Japan. 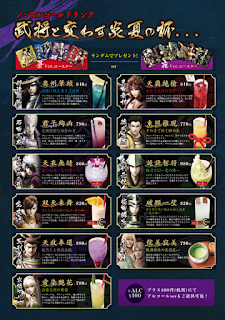 Masamune and Yukimura both inspire their own drinks, while Sen No Rikyuu's Extreme Hospitality Green Tea Cake is an option for dessert. In addition, the Capcom Bar in Shinjuku has also added a few new menu items to celebrate the game's release. 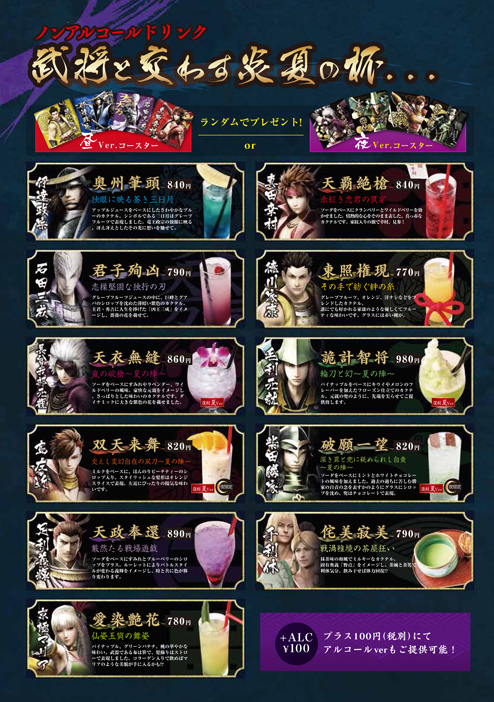 There are a pair of 'special costume' drinks themed on Masamune and Mitsunari, along with a dessert called Uesugi Kenshin & Kasuga Macedonia. 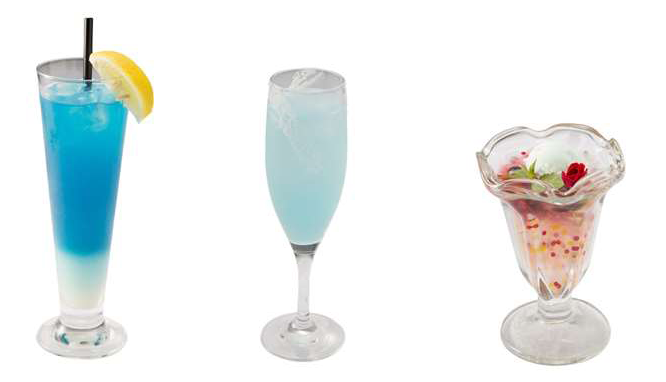 The karaoke venues and Capcom Bar are offering a different selection of six coasters for customers who order from the special menus. The tie-in food items will be available until 31st August 2015. The Sengoku-themed bar Buyuuden has a wide assortment of items for its tie-in campaign, split across the afternoon (11:00-15:00) and evening (16:00-24:00) menus. It's also planning to decorate the bar with Sengoku Basara characters while the campaign is running. There are also plenty of cocktails to choose from. Non-alcoholic and alcoholic versions are available. 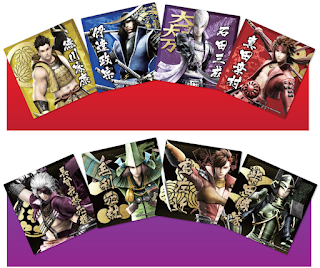 Each time you order from the Sengoku Basara menu, you'll receive a random coaster. Different coasters are available depending on whether you visit during the afternoon session (red) or the evening (purple). 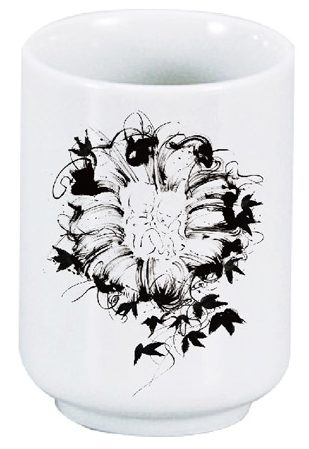 There are nine designs available in the afternoon and eleven in the evening. If you order the set menu during the night session, you will receive six of the coasters and a Sen No Rikyuu tea cup. The collaboration menu is only available until 31st August 2015. 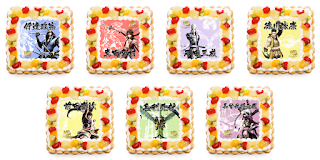 To clarify the news from yesterday, one of the three Sengoku Basara 4 Sumeragi x Gran Cyber Cafe B@gus stickers is randomly chosen and presented to customers who pay ¥1,059 for a three hour Sengoku Basara 4 Sumeragi Pack Plan at the cafes. The mouse pad is for those who visit the cafes five times during the campaign period. Details about the manga itself are still to be revealed but a bigger picture of Nekoi Yasuyuki's upcoming manga has been posted. The artwork looks great! I wonder which other characters will be appearing? 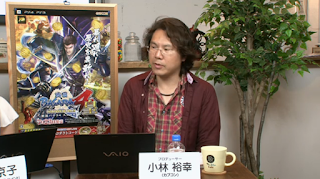 The newest Sengoku Basara 4 Sumeragi video is (Approximately) 10-second Theatre: Fuurinkazan. Naturally, it's about Shingen and offers a quick glimpse at his moveset. The highlights from last week's episode of Capcom TV have also now been posted online. Well, that's all for today! 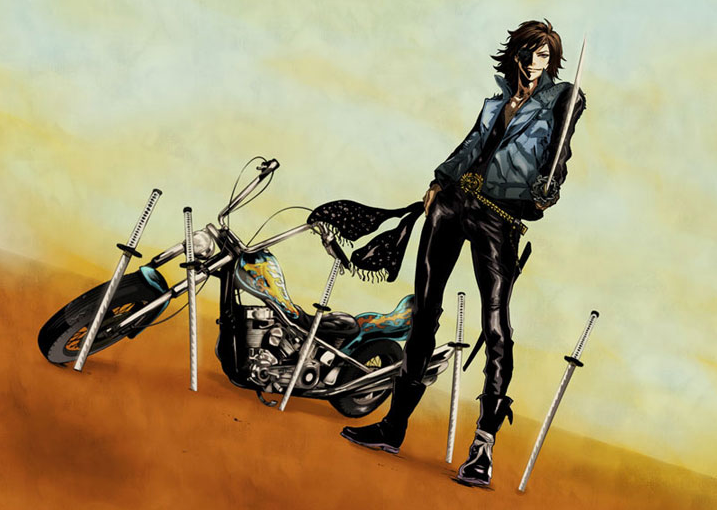 I'm going to disappear and play some Sengoku Basara 4 Sumeragi. My reference materials post will be quietly updated as more information is discovered over the next few days - the trophy list is already up thanks to Lacters! I just tested this with another account and I think you're right. On PS4, the DLC seems to be linked to the PS Store rather than the local console so if it can't find the data in the store it doesn't unlock in the game - and of course, there's no data for this game in PlayStation Stores based outside Asia. On the bright side, it gives me an excuse to play Matabee's routes again. And generally just play more Matabee! His tenka coin outfit is amazing and I cannot wait for the DLC outfits to be available so I can make him a velocidrome. Sumeragi observations: You level much, much faster in Sumeragi so despite starting afresh, I think I'll be back to where I was in no time. You also gain more and better inscriptions while playing lower difficulties (I've played 3 stages on normal and have received a few weapons with red-gold inscriptions). Roulettes can really help you to rack up big combos and I think while you're transformed you don't drop combos so that's potentially amazing! And the new stages have been fun so far! 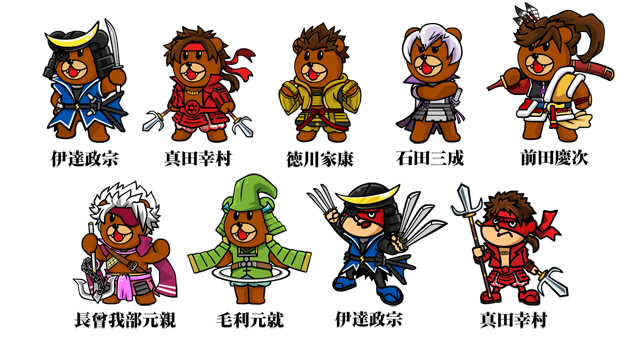 I'm going crazy waiting for my LE box to get those costumes, though as much as I adore Matabee I may be tempted to squeeze Sakon into his wrestling outfit first! The roulettes definitely help to make the battlefield feel busier. I've been playing a lot of co-op with my partner and we're noticing how satisfying it feels when the various roulette enemies crowd around ready for those combos. I was also happy to be surprised by a couple of new one-on-one stages I wasn't expecting to see. They're not as good as actual stages, of course, but after spending so long poring over every detail before release it's exciting to stumble upon new content (lol). Aside from that, trying out the new moves has also been fun for the characters I play most. I haven't even scratched the surface of testing the new inscriptions yet so a busy weekend lies ahead!